hip hop is NOT the great redeemer that all these folks are trying to make it out to be. there i said it! i had high hopes for hip hop and still do. especially when you see how its powerful force has manifested empires in so many facets of global society. it is a voice and i’m a firm believer in speech as a form of true freedom. but i draw the line in making hip hop into a ‘Savior’. i’m sticking with the essence of hip hop and speaking truth. hip hop is the new spirituality (? ), sending hate mail to dream hampton cause she tweeted about nas getting a ghostwriter (? ), defending to the end like it’s all good with hip hop (?). the messages in a lot of the songs, videos and overall vibe of mainstream hip hop is NOT COOL. let’s stop kidding ourselves and recognize that a lot of hip hop has corrupted the minds of many young and not-so young people in ways we should not be praising. those hooks of get ahead by any means, nothing matters but bling, shaking booty is all that counts is NOT the road map to success. unfortunately that teen is not the only one making crazy bunders on FB, twitter, instagram and all the many other internet sources out there. my fav is the bigbootygal@soandso email addy that popped into my university inbox. this unaware student had no clue that her email address might make an ‘impression’ on the professor she was hoping to get an opportunity to work with! i schooled her of course and she quickly got a more suitable address for professional connections. the reality is it’s not just young people who are making a mess out of social media etiquette. none of us really have an idea what and how we are supposed to be using the technology. let’s not even go there with folks talking on their cell phones when they clearly shouldNOT…we are all sucked in and getting suckered at the same time. where is the manual? why are there no classes? i really think we need licenses on some of these blogs sites of who can comment and say what. i’m not the only one ranting. according to a recent survey conducted by Intel, most Americans feel that tech etiquette is down the tubes. so this Fall, i’ve decided to start including tech etiquette as part of my college course syllabi. might as well start with the next generation to correct this cybercraziness…check my FB status for updates, LOL! 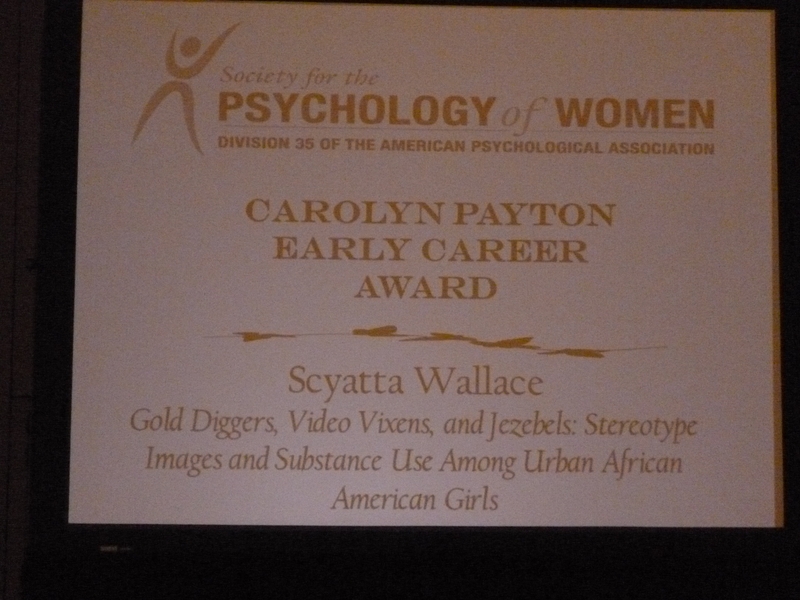 Our very own sassy.sage (Dr. Scyatta A. Wallace) was recently selected to receive the Carolyn Payton Early Career Award from the American Psychological Association, Psychology of Women Division. The award was for her recent publication “Gold diggers, video vixens and jezebels: Stereotype images and substance use among urban African American girls.” The division selected this writing as making a significant contribution to the field. Dr. Wallace takes pride in devoting her scholarship, community activism, and art to addressing the needs of girls and young women. 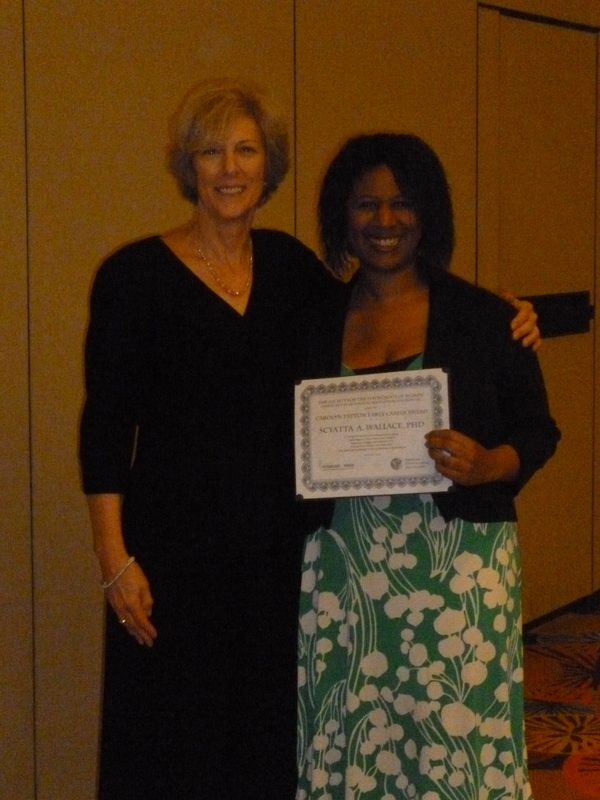 She was honored at the American Psychological Association convention this month. i decided to take a break from cyberspace for an entire month. it was an impromptu decision that i chose not to announce. i just quietly faded away for some me time and peace. i did a stay-cation and then spent a week in sedona. that red rock is amazing!!! it was a breathe of fresh air. there were times when i wanted to chime into the chatter but silence was golden. i am back so much more refreshed. i also found a new perspective on how and when technology will guide me. so many of us have gotten sucked into using tech all day, every day. i encourage you to go black, even if just for a weekend.